The Dutch Leeward Islands are said to have been discovered by the Spaniards in 1499. 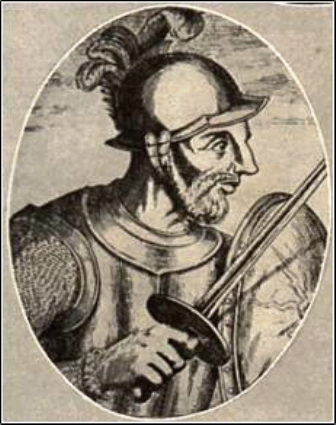 Historians do not agree wether they have been discovered by Alonso de Ojeda or by Amerigo Vespucci. Based upon drawings, maps and reports, Ojeda is assumed to have been on Curaçao and Bonaire, but not on Aruba. Probably Aruba was "discovered" a few years later while on a reconnaissance expedition. The Spaniards called the islands "Islas de los Gigantes" (Islands of the Giants) because the Indian population was quite a bit taller than they were. Another name for the Leeward Islands was 'islas inutiles' (useless islands) because there was neither gold nor silver to be found and furthermore, they were unfit for agriculture. From this term 'inutiles' the name 'Antilles' was probably derived. In 1513 the Spaniards deported the entire Indian population of Aruba (and of the other Leeward Islands) to work as slaves in the copper mines of Santo Domingo, where the local Indian forced laborers had totally been wiped out by diseases and as a result of the treatment by the Spaniards. Aruba remained uninhabited but gradually inhabitants of the main land came to the island again to settle. And a bit later, the Spaniards came back to live on the island and they used it as a kind of 'rancho', one large rural estate where horses and donkeys, cattle and pigs, sheep and goats – imported by the Spaniards – roamed about freely. The Indians served as domestic personnel and cattle herd. At that time, the Dutch were an enterprising people and sailed all the seas in the world. For the herring fishing industry, they needed a lot of salt. They got it from Spain and Portugal, but during the Eighty Years' War against the Spaniards, they were forced to look out for new salt pans, which they found in Venezuela and the Caribbean. Since their involvement in South-America was growing, they needed a foothold in the Caribbean. In 1634, the Dutch conquered Curaçao and used the island as a base of operations during the Eighty Years' War to attack the Spanish armada. In 1636, the Dutch also occupied Bonaire and Aruba to prevent attacks from these islands. The Dutch West India Company (WIC) developed the Leeward Islands to become agricultural colonies. On Aruba, they began breeding horses and particularly goats. The amount of goats on the island increased at a certain moment in such a rate that Aruba was also called the "goat island". They also cut down so-called Brasilwood, which was brought to Amsterdam where it was rasped by convicts at the Rasphouse, the prison. It was the basic material for red paint. Click here for an eyewitness account of the visit to the island of Ruba in the 17th century by Captain Morgan as written in "The Buccaneers of America"
The island was governed by a commander, assisted by some white aids. Only Indians inhabited the island and they kept an eye on the (governments-) cattle and caught them when necessary. They also cut down wood to sell. So, as a matter of fact, they could not be considered as slaves. The Indians were able to live a relatively carefree life on Aruba: the WIC had imposed a ban on settlement for non-Indians. An exception was made for WIC-soldiers who had a small settlement in Savaneta and their personnel. The Indians lived in the north-easterly part of the island, between Alto Vista (where the first Catholic Church was founded amongst the Indians) and Seroe Cristel and Hushidibana. At a first 'census' (of a sort), in 1806, 141 Indian heads of families were counted against 60 white. The almost total absence of black slaves may explain the strong Indian features on Aruba, compared to Curaçao and Bonaire. Only after 1770, black slaves came to the island, but in very limited numbers. 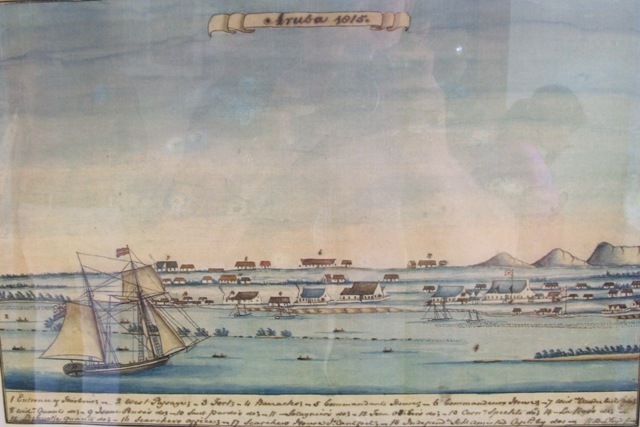 The many wars between The Dutch and the English had their consequences for Aruba. During the Napoleonic era, the English had occupied the Dutch colonies. In 1806, Aruba fell into the hands of the English and the occupation lasted till 1816. In that year, the Dutch got Aruba back from the English. From the 'English era', dates an aquarelle by R.B.Lloyd, offering a view of Oranjestad, seen from above the sea. It features only stone houses, numbered and with the mention of the inhabitant at the bottom. Also shown are the ’mountains’ of Aruba, the Hooyberg ('Haystack)' and Cahashito. At a census in 1816, 564 out of 1732 inhabitants of Aruba were qualified as ’real Indians’. The majority was catholic. In fact, the colonisation of Aruba only took place at the end of the 18th century. The Bay of Horses (Paardenbaai) of Oranjestad was used as a layover harbor for the trade between Curaçao and the mainland of Venezuela. Some migration from Curaçao to Aruba came about as well.